Scott Miller Getting into Jazz Fusion Guitar PDF + Mp3 CD download. In Getting Into Jazz Fusion Guitar, author Scott Miller presents the most common scales used in Jazz Fusion and other modern music styles. Scott discusses each mode of the Major, Melodic Minor, Harmonic Minor, Diminished, and Whole Tone scales and provides the student with conventional as well as three-note-per-string scale patterns. Scott shows many chord fingerings for each scale in standard notation and guitar tablature. Also included is a play-along CD containing one or two-chord progressions for each scale, helping guitarists solo or improvise over chords. 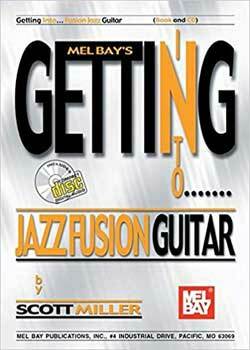 Because Scott presents the material in Getting Into Jazz Fusion Guitar in a logical, easy-to-understand fashion, all guitarists are sure to benefit from this book. This book and CD set is sure to please! The intricate pattern of scales, modes, intervals, and triads, is beautifully displayed with clear instructions, un-crowded pages, and easy to use and understand information. For those of us who don’t have dogs that can explain the difference between a BbMaj7+9/E chord, and the Phrygian Sub-dominant b9 scale, Scott Miller is our best bet. Download Scott Miller – Getting into Jazz Fusion Guitar PDF free and other books from our site. Only high quality PDF scans. Please write a review, it's important for our community.